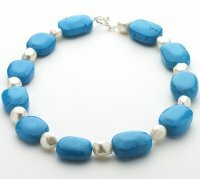 Howlite and Fresh Water Pearl Necklace. Resplendant necklace of vibrant howlite and lustrous baroque pearl. Howlite measure approx’ 25mm x 20mm. Necklace length 17 inches. 43cm.